Julia Chen was born and raised in Honolulu, where she graduated from McKinley High School in 2011. 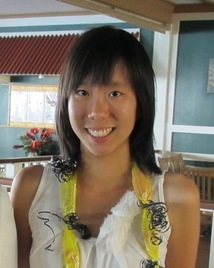 She is currently majoring in Electrical Engineering at the University of Southern California. Following the completion of her degree at USC, Julia plans to start her career in the field of engineering, and later attend graduate school for a Master’s degree in Electrical Engineering. In her free time, she enjoys spending time with friends and family, drawing, and listening to music. Magnetic gears are an innovative concept that has many advantages over traditional gears: no friction between gears, low maintenance, no debris from lubricants, and quiet operation. In order to test that the magnetic-gear winch designed by Trex Enterprises meets the standards of its client, we designed and built two carts—one carrying the winch, and the other a set of weights. The load cart has a programmable braking system that controls the pulling force or speed of the winch and sends feedback to the computer. Besides building the electric control system, one of the central issues was integrating it with the mechanical parts and the software. We connected the circuit to a LabJack and the electric brakes, and ensured that the circuit received signals from the program and sent them to the brakes to maintain an actively controlled load. This was accomplished through a proportional-integral-derivative (PID) controller that uses a load cell to provide real-time information on the pulling force in volts. The PID controller was tuned to minimize oscillations and stabilize the load set-point. In addition, the output current from the PID was amplified using a buffer and a Darlington configuration to drive the electric brakes. During testing, the winch cart was anchored and pulled the load cart in a straight line as a program collected pull force and speed data. We established a load set-point to observe the changes in the speed until a steady reading was attained. This was repeated for various set points. As a result, we were able to fully characterize winch performance over its full range of operations. Future work with the carts will involve testing winch designs that are currently in process.